Nike’s third tier Tiempo boot after the Legend and Legacy is the Nike Tiempo Genio. The Tiempo boot range is the top choice for defenders who love to put in strong tackles and require that extra comfort and protection. 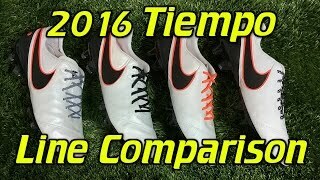 Genio boots have the same look and feel as the top tier Tiempo boots, however, are available at a much cheaper price, so perfect for youth players. The boot provides a very comfortable fit and a great touch on the ball, due to the natural leather upper Nike have included in the boot design. The Genio (and full Tiempo range) are perfect for the player who prefers the more traditional football boot and the term ‘value for money’ comes to mind when discussing this boot. 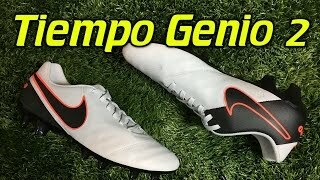 Nike’s Tiempo Genio has the same last design as the Legend and Legacy, which ensures that players will have a superb fit from the first time they try the boots on. Nike has also included a protective heel counter to support against kicks and knocks. The inner boot is lined with an EVA sockliner that reduces the pressure from the studs underneath. Whilst the stud configuration itself comprises bladed and conical studs configured to provide stability and traction.